Details relating to the Luxembourg Commemorative of 2014. 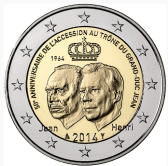 This coin commemorates the 50th anniversary of the accession to the throne of Grand Duke Jean. After the abdication of his mother on 12th November 1964, he acceded to the throne and took the appropriate oath on the same day. In the inner circle the effigies of the two grand dukes, Henri and Jean are shown, both looking to the left. Under the effigies are the names of the respective grand dukes. A shared crown is above the heads of the two grand dukes. The date of accession of Jean (1964) is shown above his head.The year of issue 2014 is at the bottom and is flanked by the mint marks. Note: Interesting point – going against the standard requirements there is nowhere an indication as to what the issuing country is. From Luxembourg Commemorative 2014 to euro coin collector.